Wishing you all a very happy Independence Day! I still remember this moment from two-years ago. I’m extremely happy to say that since then I haven’t had a rupee in debt and I am well ahead on the road to financial independence. Freedom from financial reliance on loved ones. Freedom from financial reliance on creditors. Freedom from financial reliance on employment. This honestly is the best financial advise I’ve ever come across. As I wrote in last month’s update, I have indeed started a “stupid mistakes” savings goal. The intent of these savings is to have some real cash saved up so that my cash flow doesn’t turn negative whenever I make one of those “I shouldn’t really have purchased this but I did” mistakes. 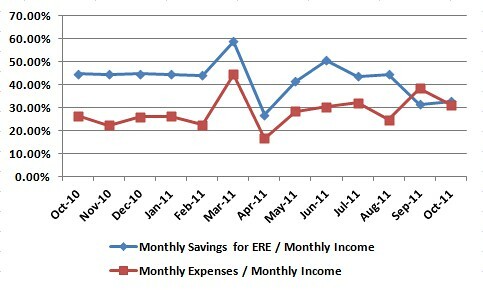 I’m also expecting the ERE Savings Chart to bounce back up in November, 2011. That’s something to look forward to! A pretty bad September. Expenses crossing ERE Savings in the wrong direction. 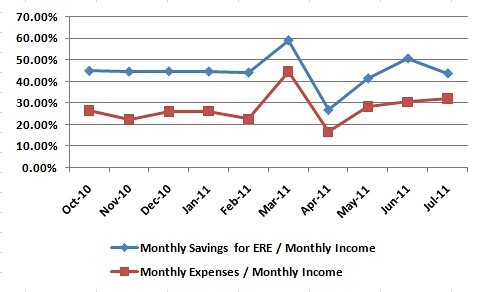 Exactly what an ERE Savings Chart shouldn’t look like. Maybe I ought to have a “stupid mistakes” savings goal as well? My apologies for the prolonged delay in announcing the winner of the book giveaway. Finally managed to draw lots and the winner is Ashutosh Tewari. Congratulations! There will be another book giveaway next month. Next up on the giveaway list is I Will Teach You To Be Rich. Again, nothing out of the ordinary. I seem to have settled into a sweet spot between all my needs and wants. I completed reading the ERE book as well. The first half is an excellent read; the second half seems to be a rush through, but pretty useful nonetheless. I’d now like to hand this knowledge source over through a book giveaway. Here’s how you can grab the ERE book. Simply leave a comment explaining why this book would be of great benefit to you today. I’ll draw lots and announce the winner mid-September. Predictably, my ERE Savings Ratio is 43% (43.70% if you count two decimal points). 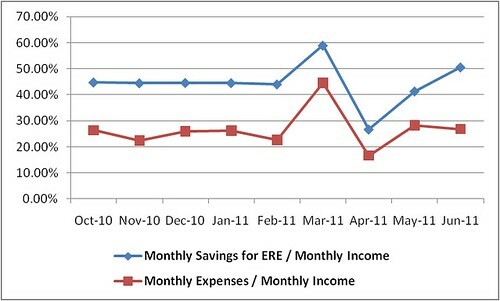 How My ERE Strategy to Financial Freedom is Faring? I’m a big fan of ERE. When I embarked on my journey towards financial freedom last year, I followed many of the principles outlined in ERE, just that I didn’t know there was an official term for doing what I was doing. I contribute first and foremost to my financial freedom fund. My paychecks now pay for my paychecks later. I have a defined target that I absolutely must meet each month. This tactic has worked so well that I can’t believe how much I have saved over the past nine months. I then contribute to my short-term goals. Sounds weird? Sounds counter-intuitive? Whatever happened to my medium-term goals? I want to enjoy the “now” as well — completely and without regret. My medium-terms goals (such as saving-up cash for my next car) are certainly important but come lower down the pecking order. I then contribute to my medium-term goals. I just have one at the moment. Finally, I either splurge whatever’s left or, if I’m in an aggressive ERE mindset, I contribute whatever’s left as a bonus into my financial freedom fund. 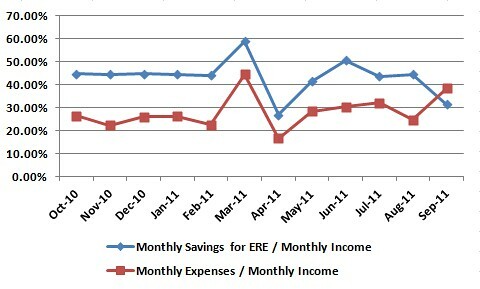 Monthly ERE-savings are, on an average, 43% of my monthly income. 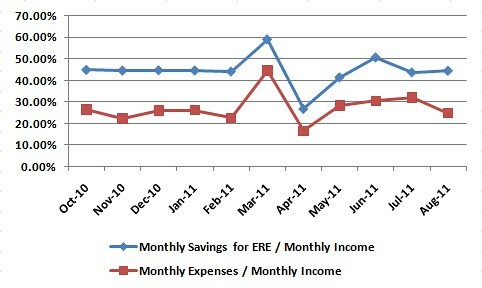 Monthly expenses are, on an average, 26% of my monthly income. The remaining 31%, on an average, goes into everything else. I can break this down further if you’d like me to. I want to bump-up that 43% closer to 50%! That would be serious ERE. That would require me to burn less petrol each month — consider this: 49,000 kilometers on the Swift odometer, 10 kilometers per liter of petrol, 4,900 liters of petrol, Rs 65 per liter of petrol (on an average), you do the calculations. D won’t let me do it. She’s smitten with the Swift. Financial Independence vs. Financial Freedom — Is There a Difference Between the Two? The more I read-up on financial independence and financial freedom, the more I’m beginning to appreciate the subtle differences between these two terms — or rather, phases in one’s personal finance journey. So, when you’re financially independent, you don’t owe a dime to anyone and you’ve got your risks covered, but you still need to do something, but not work as we know it, to put the bread on the table. In this phase, however, you might still be trading some of your time for money. So, when you’ve achieved financial freedom, you still don’t owe a dime to anyone and you’ve still got your risks covered. However, you don’t need to do even that something to put the bread on the table. In other words, you simply don’t trade your time for money. You’re paid interest to live rather than you paying interest to live. What’s common between these two phases is quite clear. Get rid of your debt, sock away for a rainy day, and buy as much health insurance cover as you can and you’ll be well set for the journey towards financial independence and financial freedom. And they’re not sequential. Because you can inch towards financial freedom while you strive for financial independence. That’s what I am doing. Do neither though and you’ll continue to trade your time for money — and that’s a bad thing!